A few years ago, I met up with a friend that I hadn’t seen in a while for dinner. First thing out of his mouth was “You look like crap!” (it wasn’t exactly that, but I am keeping it clean 😊). What a great way to greet a friend, right? In response, I gave him the finger and then said hello. I felt the turnaround was fair play. He asked me if everything was okay and clearly it was not. That was the year that we grew by 60%. We were firing on all cylinders but towards the end of that year I was exhausted and it showed. I told my friend that I was burnt out and needed a vacation. His response was “so take one.” Simple solution. I told him now was not the time to take one and he laughed at me. Once again, he got the finger!! However, he was right. I knew that I needed to take a step back. I needed to go away to relax and recharge or my work would suffer. Or even worse , I would suffer. What I realized over that dinner was it is never a good time. Almost every vacation I had taken since we started the company had been at a bad time. If I was even considering a vacation something pressing always seemed to come up! Some vacations I cancelled, and some I took anyway. We always come up with excuses as to why it’s not a good time. We want to get healthy and eat right…but we will start the diet after the weekend. We want to join a gym to lose the weight…but we will join a gym after we lose weight, (I know that excuse seems ridiculous and counter-productive, but I have heard it). I want to go on vacation…but will wait until the time is perfect and nothing is going on. The truth is, there is always something going on. Sometimes we just need to take that one step to make life a good time, for me that night it was booking a plane ticket. 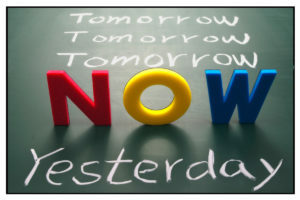 The perfect time to do something is NOW!! !